Eric Grimson PhD ’80, Chancellor of MIT since 2011, will leave the Chancellorship and take on the ad hoc role of Chancellor for Academic Advancement, President L. Rafael Reif announced in an email to the MIT community Tuesday morning. 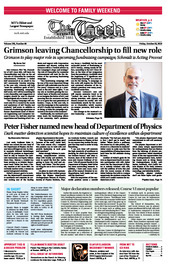 In the new role, Grimson will help “meet the ambitious goals of MIT’s upcoming fundraising campaign,” Reif wrote. MIT will be searching for a new chancellor, and suggestions or insights should be sent to chancellorsearch@mit.edu or Room 3-208. Last week, Professor Peter H. Fisher was named the new head of the Department of Physics. His five-year term will begin on Nov. 15. Fisher succeeds Edmund Bertschinger who left his position as department head in July to become the Institute Community and Equity Officer. Since then, Thomas J. Greytak has been serving as an interim department head. Fisher has been a faculty member at MIT since 1994. He currently teaches 8.033, a course on special and general relativity. Earlier this month, the Registrar released enrollment statistics for the Fall 2013, detailing the primary majors chosen by students of the sophomore class. Course VI, Electrical Engineering and Computer Science, was once again the most popular primary major, accounting for 367 students, or 32 percent of the sophomore class. Opinion was not published this issue.